Labor can be intimidating for many pregnant mommas, especially with all of the stories many moms are faced with when it comes to birthing experiences. There is also a lot of negative talk surrounding birth. Moms are constantly faced with stories about the pain of birth. It can be very easy to let fear set it. For first time moms, the fear of the unknown can also make things stressful. However, there are so many ways you can prepare your mind and body to have the birthing experience you want! Being completely present and mindful can be extremely helpful as you power through labor one contraction at a time. Being mindful may also be able to help change the way you think about labor, making each contraction a little more bearable. Before we jump into these mindfulness techniques, let’s look at what mindfulness is. Mindfulness is being present in the moment with full acceptance. It’s about being aware without any judgment. So, let’s look at three mindfulness techniques you can use to prepare for labor. This is super important during labor and delivery, but it is something you can definitely start practicing while pregnant. Whenever you feel challenged, be mindful of your breath. Look at how you are breathing. Could you take some long and deep calming breaths? Being mindful about how you breathe when you feel challenged can be incredibly helpful when experiencing a contraction during labor. 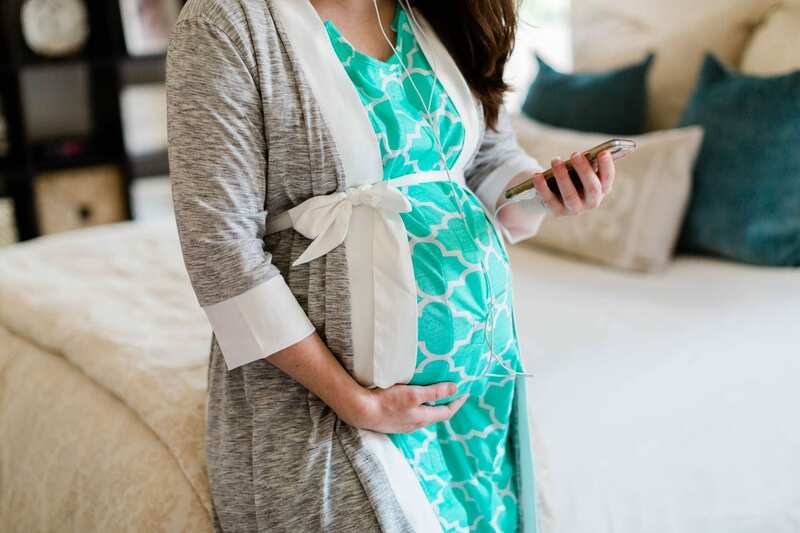 Being as calm and present as possible will only help labor contractions progress getting you one step closer to your bundle of joy. When you are experiencing pain during labor and delivery, come back to your breath and bring mindfulness to the moment. Acknowledge the pain, but tell yourself it’s a positive pain there to help you have your baby. Acknowledge the pain for what it is instead of focusing on how badly it hurts. When you start to focus on how badly it hurts, you can quickly spike your anxiety and negative self-talk which may ultimately stall labor. Try to welcome these contractions and know that your body was designed to do this! Welcoming them and breathing through them with mindfulness can help you better cope with the pain as opposed to fighting each one. It will also help your body relax and thus help you conserve much-needed energy. Whenever you are feeling fatigued, distracted, or discouraged during labor and delivery, always come back to your breath. This will help you re-center yourself and get back to where you need to be to get to your end goal which is holding that beautiful baby you have been waiting to meet! The more mindful you are, the better your mind and body will feel throughout each contraction. Hire a Doula For a C-Section?